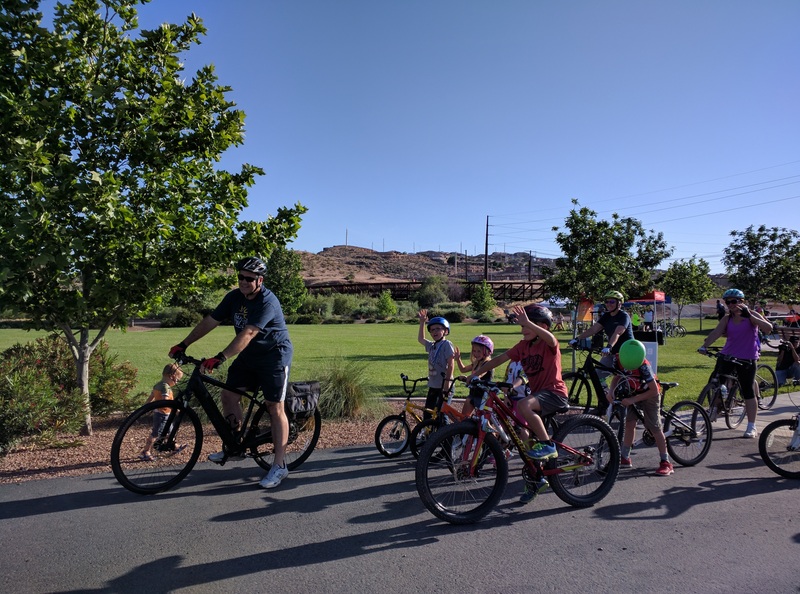 ST GEORGE — A city-organized event brought together bicycling enthusiasts, kids and city officials, including St. George Mayor Jon Pike, for a 5-mile tour of some of the city’s available bicycle trails Monday evening. The biannual “Bike with Pike” event served as a kickoff for National Bike Month. The community was invited for free food, fun and biking information at the Crosby Family Confluence Park, 1850 S. Convention Center Drive, where the park fittingly serves as a trailhead for the Mayor’s 5.2-mile loop, where the Virgin and Santa Clara rivers meet and the Virgin River and Santa Clara trail systems branch off. 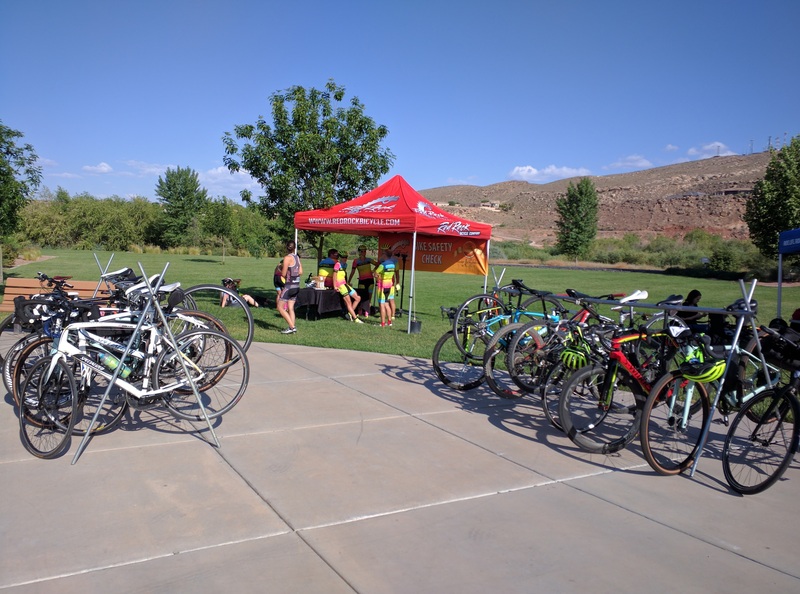 “A lot of people share cycling as a common interest and so we hold this event so people can get to know each other and also just experience the joy of riding in Southern Utah,” St. George Assistant to the City Manager Marc Mortensen said. Mortensen, who also serves on the city’s Active Transportation Committee, said that accommodating bicycling in St. George is a major priority for the mayor and the City Council. The recently adopted plan was the result of 1 ½ years of planning and discussion with input from over 600 people, Mortensen said, including community members and city officials. “We have identified in this plan some ways that we can enhance that (transportation plan) with bike lanes that are wider and some that would be buffered with striping and additional stencils to really call attention to the fact that bikes are going to be there,” Pike said. Such plans have already been put into motion and will be implemented in the coming months. In addition to making it easier to get around by bicycle, the city is also seeking to get bikes into the hands of more people by working to help permanently establish the Bicycle Collective of Southern Utah in downtown St. George. The Bicycle Collective is a nonprofit organization focusing on providing bicycles to kids and low-income households with discounted recycled bikes. 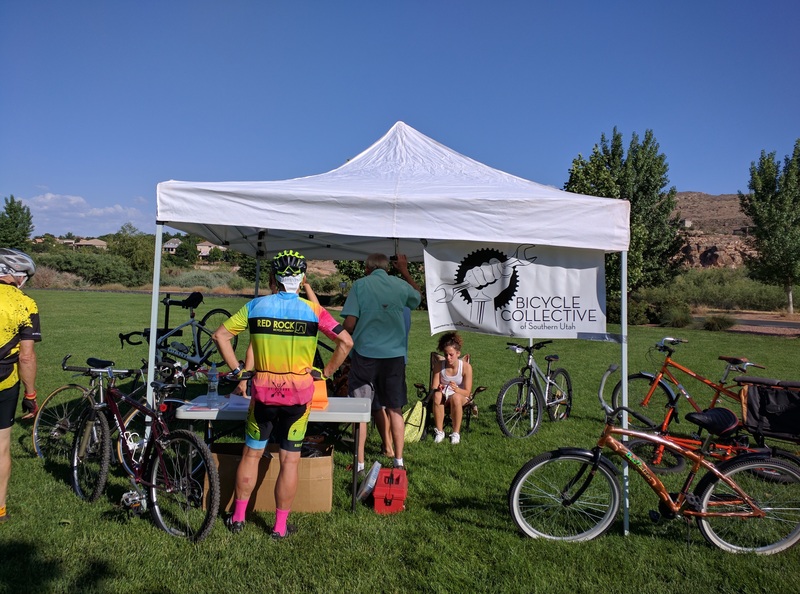 “We take donated bicycles, we fix them up and we put them back out into the community,” Dannielle Larkin, board chair of the Bicycle Collective of Southern Utah said. The collective accepts bikes from all sources, including private donations and unclaimed bicycles from the police department. Any bike is accepted, regardless of whether it’s in working condition. The collective works on volunteer labor, and people can earn bikes instead of paying for them by helping with maintenance and repair work. “People can come buy them for a discounted rate or if they don’t have the money for a bike they can come and earn a bike or we can give them a bicycle if they’ve earned it through Switchpoint (Community Resource Center in St. George) or the soup kitchen or any of the other charitable organizations in town,” Larkin said. The collective had a booth at the event to get the word out about the affordable-yet-quality bikes the organization offers and to help increase bicycle use in general. As part of the month’s celebration of biking, the city is also holding a “Bike to Work” week May 15-19, encouraging commuters to leave their cars home and ride to work.